Jan 8 What's Your Thing? I also realize I haven't shown much of our own home yet on this blog. It's been such a slow process getting this house to feel like US. It takes time to settle in. 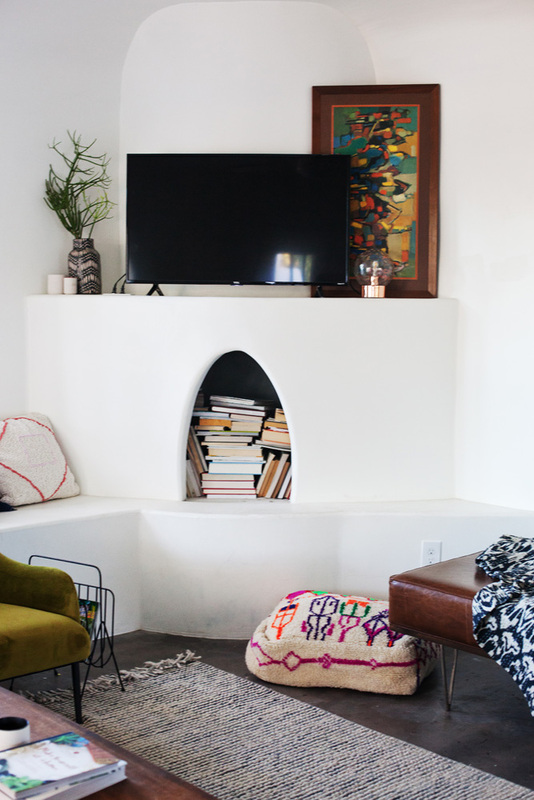 As a decorator, it's really easy to put a room together in a couple of days and have it look cool and cohesive, but when you're living in it - wow, who knew how much harder it would be? It's finally shaping up to be something we love, although I still have some changes up ahead. Hah! For the living room, the Pendula Lamp is the best lamp I could have chosen. We have can lights in the ceiling which are great for when you need a lot of bright light, but when you're at home with your family at night, a nice soft, warm light feels like the right amount of cozy. The light in your room helps determine the mood! It's also easy for the kids to turn on with a floor button, and the marble base makes it sturdy. Also in the living room, we have an Oracle Lamp in copper up on the mantel. These are literally the only two lamps in the whole room and it's all we need at night! This one is a fun accent light to have and I love the pop of copper against the white fireplace. And here you can also see the state of things - the books aren't going to stay in the fireplace (finally got a bookshelf! Wow - adults!) but then what to put in there? We also chose a Pendula Table Lamp in gunmetal for the dining room. It's like the same as the floor lamp, only mini - marble base and all! Same warm, soft light. Perfect for dinner parties (that we haven't actually had, because our kitchen counter tops are still made out of cardboard. But that all changes THIS WEEK!). And although our bedroom is kind of a catch-all at the moment (so I'm not going to show you anything but this lovely corner, which I thought would be a reading corner, but it's kind of more of a laundry corner at the moment - hah!) I love this little space. Eventually I'll have less clutter and be able to show you more (and we're planning on having a greenhouse right outside the french doors that are next to this spot), but for now, this is the reading / getting dressed nook! How good is that Gira Floor Lamp!? I love the stark contrast of the black against the white walls, and at night, the directional light is perfect. Okay. Are you ready for my favorite lamp? I think I was surprised by how this one has become my most-used, and my most-photographed fav. It's also under $80 and it's kind of a dream! I wish I had one in every room - and maybe one as a floor lamp one day! Here she is... the Leap Table Lamp. I LOVE the copper stand paired with the matte black. It's classic, it's gorgeous. It's like a piece of art itself. The soft light is perfect. We keep this one on day and night - it's a nice dim glow to have on at night in case the kids get up and need water (it lives on a console between our dining room and kitchen). Jul 29 ROUNDUP: My Favorite Lighting (under $100)!